The word is definitely out about the remarkable benefits that unpasteurised apple cider vinegar have for your flock of cheeky chooks. Many a Chicken Lady has been adding a few powerful drops of apple cider vinegar into their flock's waterers and feeders and reaping the brilliant benefits. But why does apple cider vinegar have such astounding benefits for you hens’ health? Stick your beak into this no nonsense article that will help explain the eggstraordinary benefits of this marvelous medicine! 1. Keeps the body in balance. Every animal’s body is a profoundly complex balancing act of chemicals, vitamins, minerals – all sorts of complicated things! Most body’s need to have a slightly alkaline quality, normally with a PH ranging between 7.3-7.4. Apple cider vinegar essentially has an alkalising effect, despite actually being more on the acidic side itself - the chemistry is of course a little on the confusing side. The important thing to note is, if a chicken's body is too acidic they are not going to be feeling in top form and may become vulnerable to disease. Long story short, apple cider vinegar helps keep you or your chickens health in balance by regulating the body’s PH so that everything can run at its peak. 2. Boost the immune system. Keeping the chickens healthy is one of the key concerns of any Chicken Lady. As many poultry lovers have sadly discovered, if one chicken gets sick it quickly spreads to the entire flock! This of course is easily preventable so long as you boost the immune system of your girls. In an eggshell, this is because a healthy body - slightly on the alkaline side - will be able to fight disease and infection more effectively. All it takes is a few teaspoons of apple cider vinegar each day to help fortify your flock’s immune system, keeping them safe from all sorts of nasty diseases that they can pick up on their daily adventures free-ranging. This being said, there's no sense in mollycoddling your ladies - every wise Chicken Lady knows there comes a point when you need to accept all the natural risks that surround your flock and let your girls be free! There are a few brands of apple cider vinegar on the market, which can sometimes make the choice more complicated than it needs to be. For hen and human health it is best to go with an apple cider vinegar that is unpasteurised - hang on!? Unpasteurised? Yes, though it may seem counter intuitive, unpasteurised apple cider vinegar contains the “mother vinegar” that not only has an alkalising effect on the body but is also a dense source of raw enzymes, gut-friendly bacteria and natural acids. This means that apple cider vinegar is not only boosting your flock's immune system but it also helps flush out nasty toxins and bacteria that can build up inside your chickens bodies. To put it simply, unpasteurised apple cider vinegar is simply better for your flocks health. Regular doses of apple cider vinegar is one of the easiest ways to prevent your flock from becoming infested with worms, mites and lice. Essentially, if consumed in safe quantities regularly, apple cider vinegar will begin to seep through your chooks’ skin and repel mites and other pests. Also, buying a pasteurised apple cider vinegar with added garlic is an even more effective way to really teach those nasty mites a lesson! As many people know, garlic is a great way to not only boost your flock’s immune system, but it also helps prevent and treat mite and lice infestations. Be mindful though that ludicrously excessive amounts of garlic (I'm talking like a full bulb) can change the taste of your girls eggs and in extreme cases cause liver damage. One of the best things about apple cider vinegar is that it only takes a little bit every day to make a huge difference for the health and happiness of your flock. Add 1ml per chicken to your flocks feeder or waterer and that’s all it takes. For example, say you have five chickens in your coop, all you’ll need to do is add 5mls to their water supply each and every day. Pretty simply stuff and believe me, it is a lot easier than attending to a flock infested with mites or lice! For most chicken lovers it will be easier to simply add a few drops of apple cider vinegar to the girls waterer each and every morning - but there are still plenty of alternative ways to administer this wonderful, immune boosting product to your ladies. Mixing it through into their chicken feed or treats is another way you can ensure your girls get their daily dose of apple cider vinegar. Some Chicken Ladies put a few drops of apple cider vinegar into a spray bottle and give their girls a little spritz on hot days or if they spot a few signs of mites or lice. On those rare occasions in summer or spring when you decide to bathe your chickens it definitely would be beneficial to add a few drops of apple cider vinegar to their bath water. It’s all too easy to find different ways to administer apple cider vinegar to your chooks! But, the good news is your chickens instinctively seem to know that apple cider vinegar is good for them because they rarely put up any resistance to drinking, eating or even bathing in it! 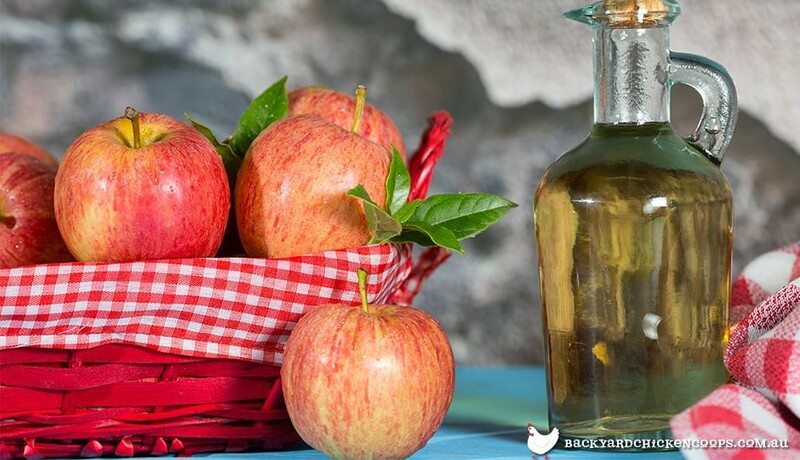 Though your flock with definitely experience huge benefits from apple cider vinegar becoming a regular part in their diet, there are still so many other ways to use this wonderful natural product. 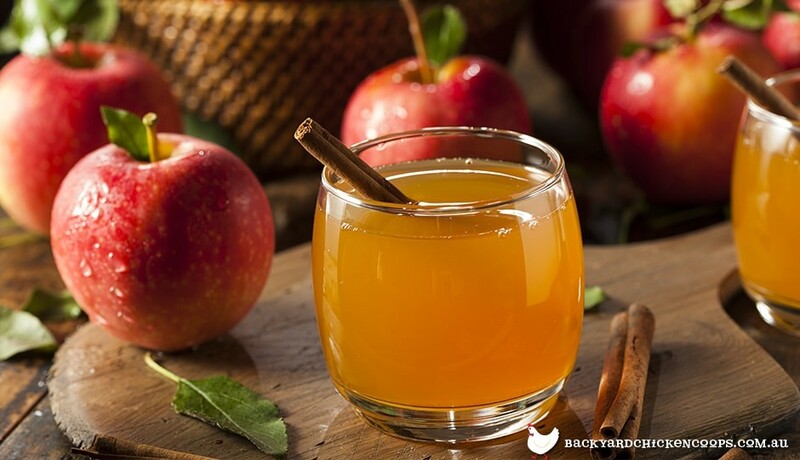 People consume apple cider vinegar to help boost their own immune system and add some flavour to a meal. It’s a popular ingredient used in salad dressings, smoothies and herbal teas. 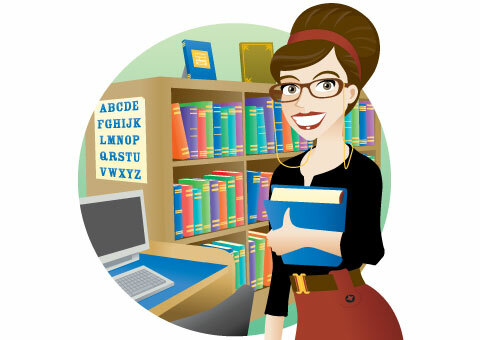 Also, people use apple cider vinegar to help clean all sort of things around their home: from kitchen counters, to scummy old feeders and waterers to the chicken coop itself - grease and grime are no match for apple cider vinegar! Just because a lot of Chicken Ladies invest in apple cider vinegar to help secure their hens’ health that doesn't necessarily mean that your chickens get to have all the fun. There are so many ways you can enjoy the benefits of apple cider vinegar in your home. The advantages of including apple cider vinegar as a regular part of your flock’s diet is a simple way to boost the overall health and longevity of your beloved girls. Keeping your chooks in good health is one of the purest ways you can express you love, dedication and appreciation for all that they do for you. A Taj Mahal, Penthouse or Mansion coop is also one of the easiest ways to show you love your chickens. If you’re planning on keeping chickens or have been a long time chicken lover, do consider investing in apple cider vinegar to help promote a healthy lifestyle for you and your chooks.